Do you have a group of friends, relatives, colleagues, etc. all of whom trust you and are ready to pool in some amount as capital to conduct a specific business activity for generating profits? If that’s the case with you then it is the right time to incorporate a limited liability company and get started to rake in some moolah. 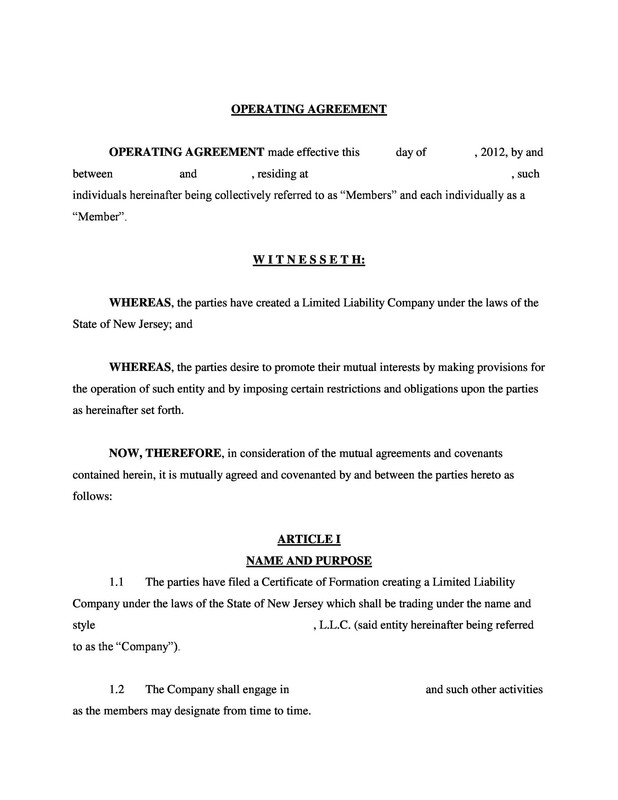 3.2 Amendments in the LLC Operating Agreement, is That Even Possible? 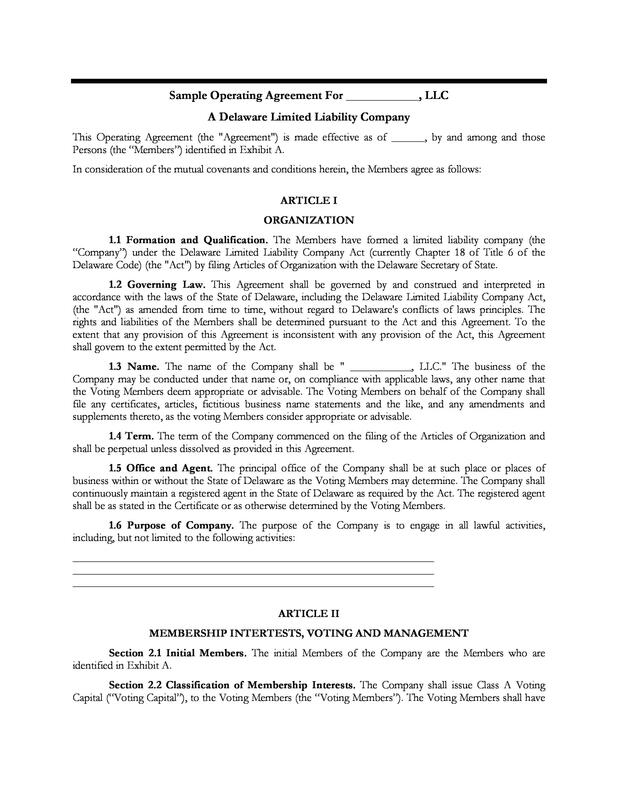 3.3 I Ain’t a Lawyer, How Can I Create My Own LLC Operating Agreement? 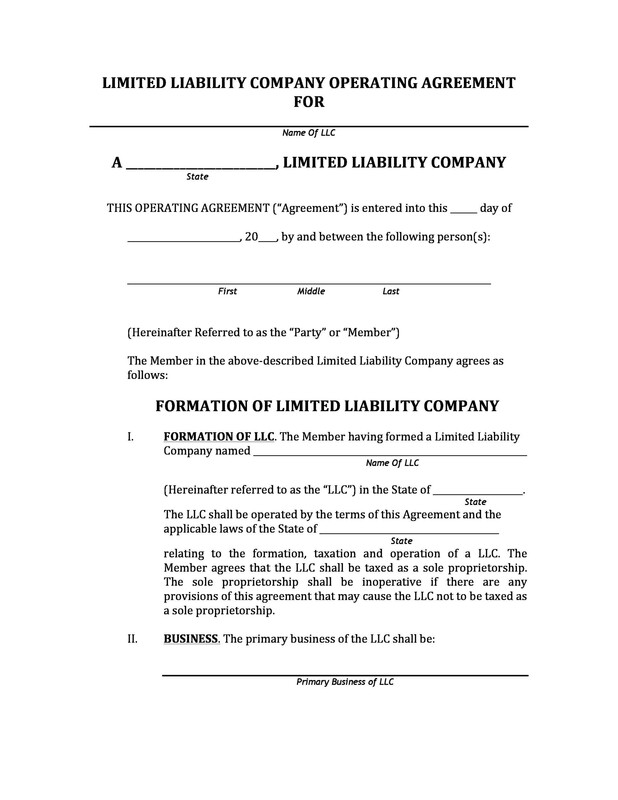 LLC is an acronym for Limited Liability Company, which means that in case of insolvency, the liability of the company will limited to the capital that the members have invested in the firm, and the wealth of owners will not be used in order to settle any uncovered liabilities. An LLC is also considered as a separate legal entity (or a separate person) from their owners which means that it can sue or be sued in the court of law. The legislation, allowing the formation of Limited Liability Companies (LLC) was first passed by the state of Wyoming in 1977 and now almost over two-thirds of all the new companies formed in United States are LLCs. A Limited Liability Company is not necessarily a corporation; it’s simply a legal form of company that provides the benefit of limited liability to its owners. Forming a Limited Liability Company is surely one giant step but it is just the beginning. After the formation of the company you need to have some rules and regulations in place that will govern the operations of your company and will ensure that the company operates and performs according to the set rules and standards. 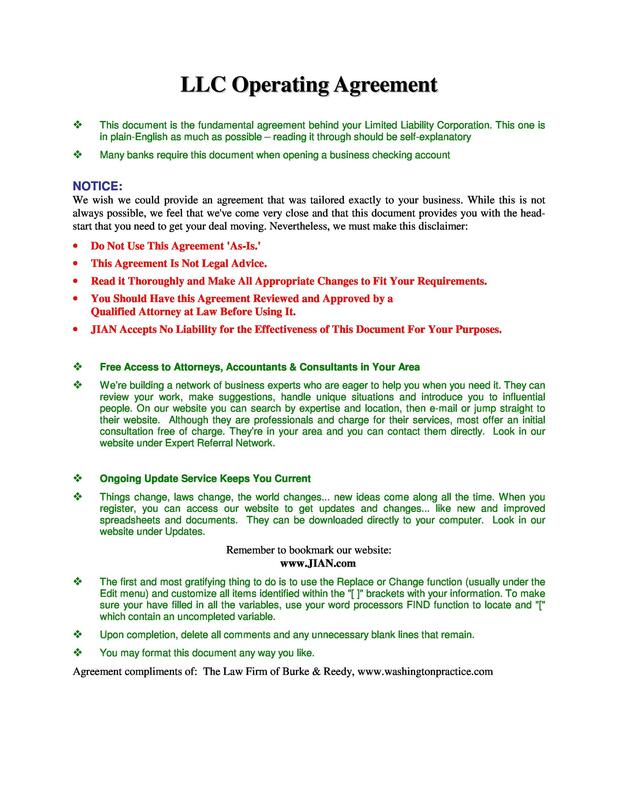 These rules and regulations are all covered in the LLC’s operating agreement. 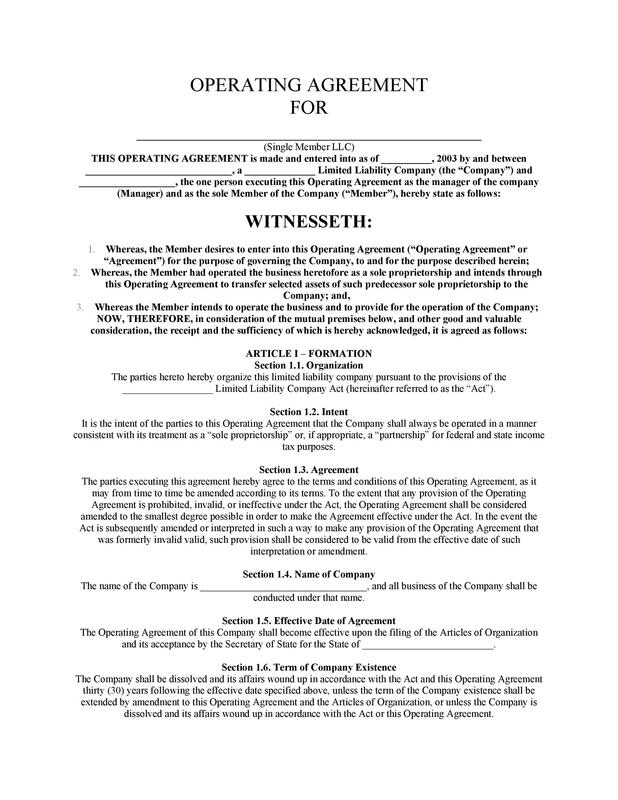 Operating agreement, in a nutshell, is like a bible or a torch in the dark that will guide the members of the company regarding what step they should take when faced with a certain situation. Nope, it’s not necessary, it’s imperative! Who doesn’t want to exercise full control over their company and run it in their own way? 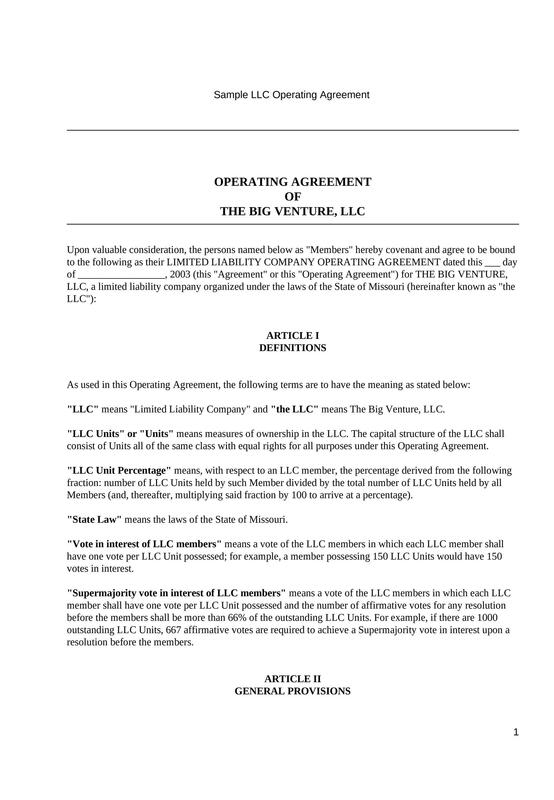 An LLC operating agreement allows members to set down rules regarding various business operations that will govern the day to day operations of the company. It also allows members to establish each owner’s percentage of ownership in the LLC, their rights and responsibilities, their share in profits (and losses), and the process if the member wants to sell his stake in the company. 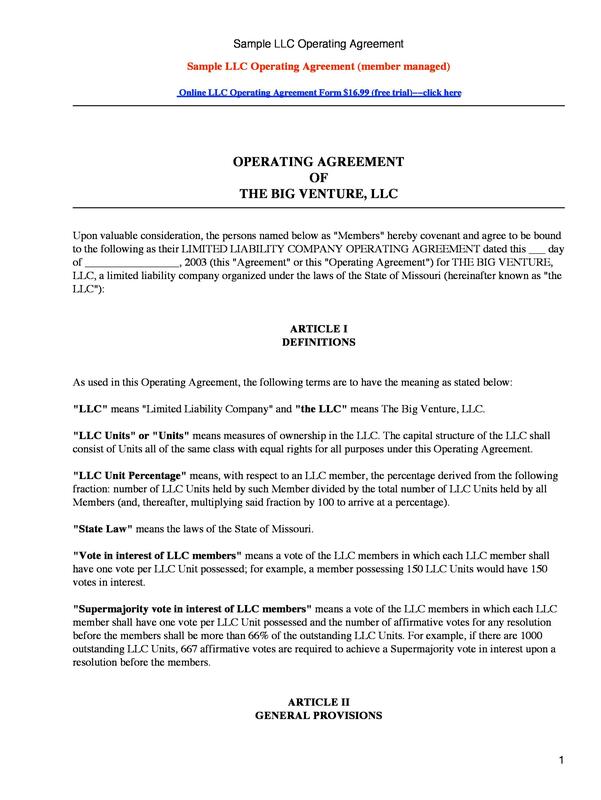 Whenever any discrepancy arises between members of an LLC, this operating agreement will serve as a guide to resolve such odious situations. Every state in US has some set of rules for limited liability companies that govern the business, unless the members of the LLC decide to have their own operating agreement. 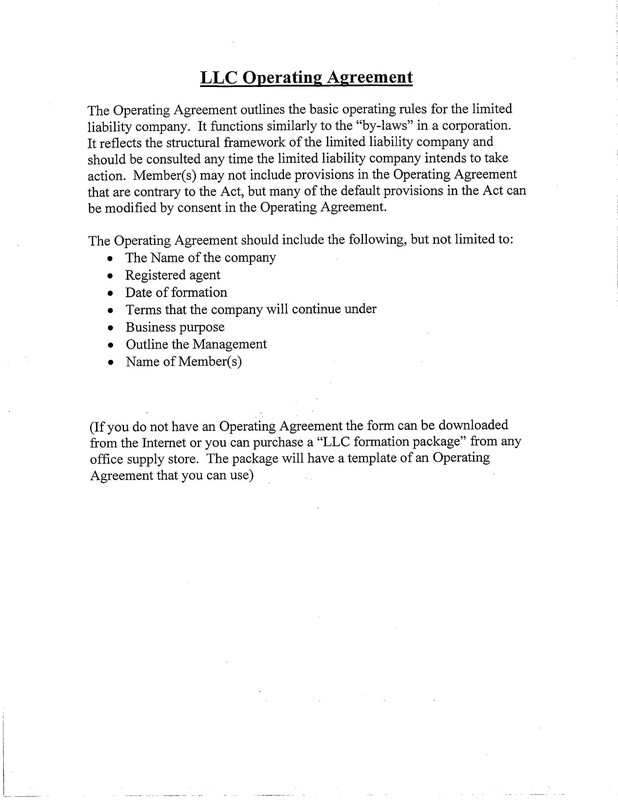 This operating agreement overrides all the default rules provided by the state. Now you may be thinking, ‘why should one waste his/her time in drafting the operating agreement when the state have already provided it?’ After all, they are there for a reason. If that’s what you’re thinking then let us give you a little taste as to what the state rules (also known as Default Rules) for LLCs are. Default rule require owners of LLC to divide the amount of profits equally among them no matter what their share of contribution is. Well, if you are a sworn capitalist, who does not believe in free lunches, then this statement must’ve sounded pretty crazy to you. So, draft your own operating agreement by using LLC operating agreement templates from our website and override state’s sick rules. 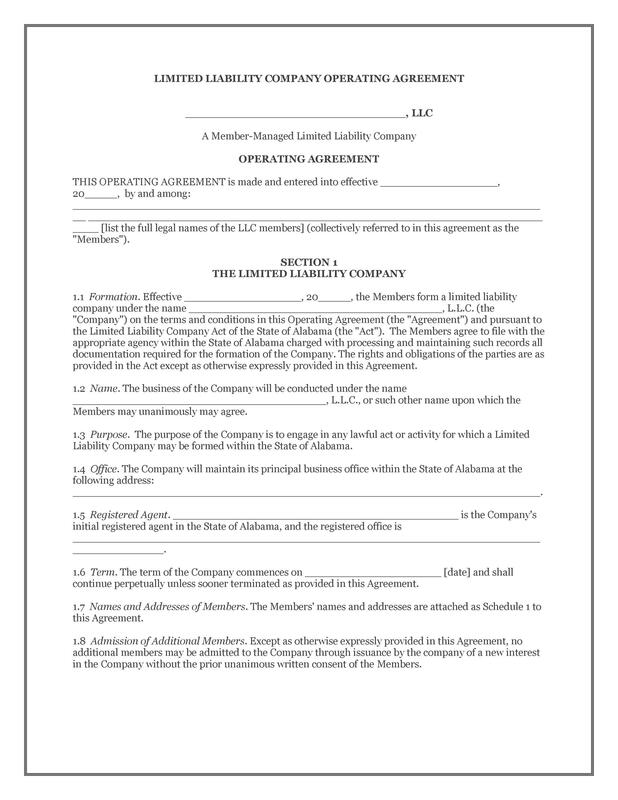 Amendments in the LLC Operating Agreement, is That Even Possible? 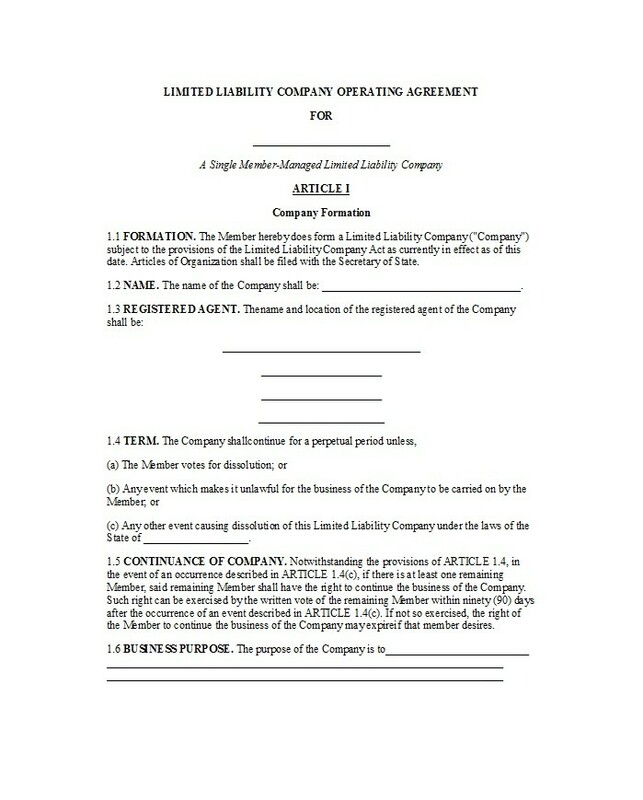 Yes, it is possible if you included the provision of amending the operating agreement in the original version of the LLC operating agreement. Otherwise, you will be subject to the state’s default rules for amending the operating agreement. According to the state’s default rules, unanimous consent of each and every member is required to be eligible to amend the operating agreement. 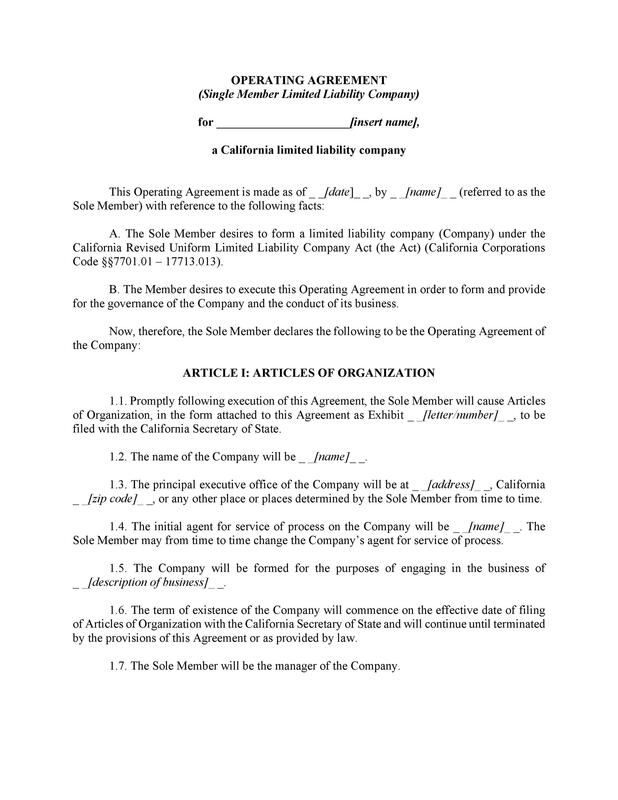 I Ain’t a Lawyer, How Can I Create My Own LLC Operating Agreement? 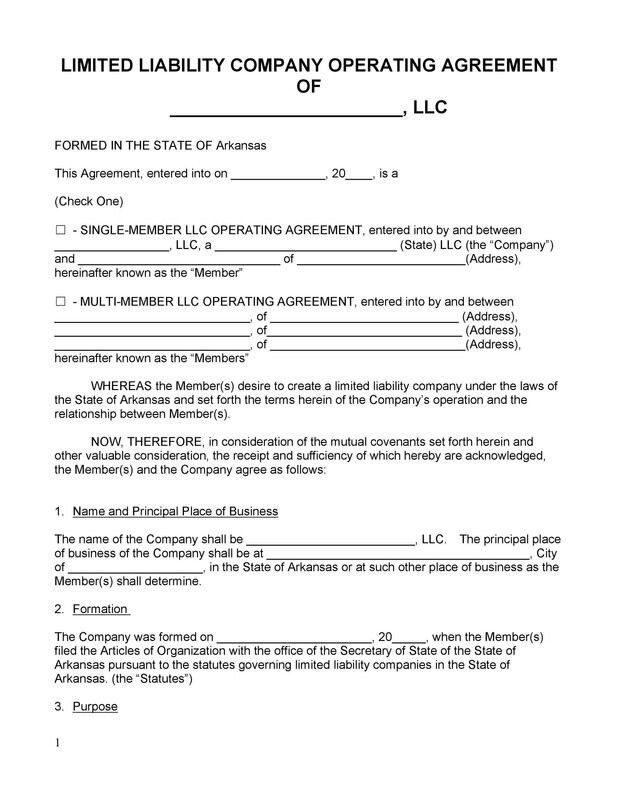 Now don’t you be thrifty when it comes to creating an LLC operating agreement. You will definitely be requiring the services of a lawyer or consultant to cover all the provisions that will allow the members of the company to exercise full control over their LLC. 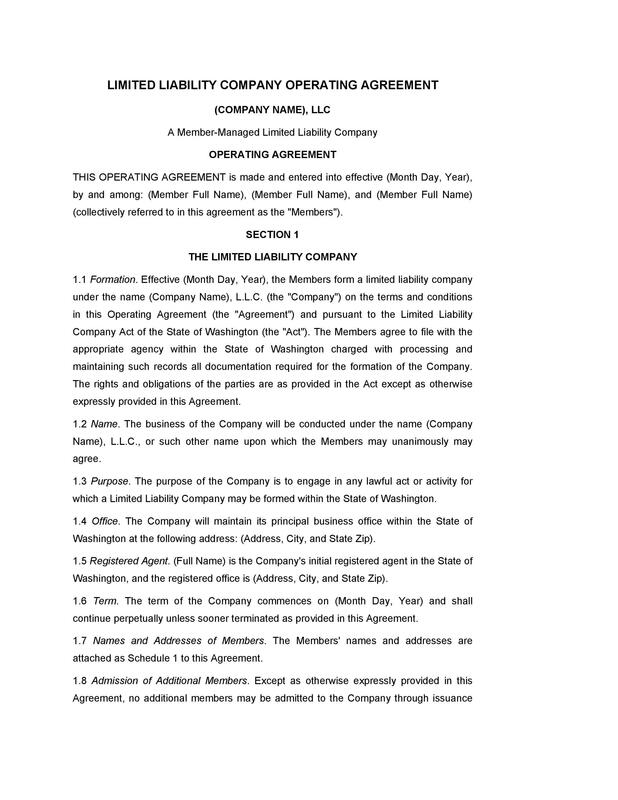 However, if you want a feel of what an operating agreement looks like then you can visit our website where we have lots of free downloadable LLC operating agreement templates. Each member’s interest percentage in the LLC is determined by how much capital is that member contributing during the formation of the company. However, it must be noted that this is not a rule of thumb; it is possible that a member who contributed only 10% of the capital during the company formation gets 20% ownership in the LLC if, and only if, all the other member agrees. This is usually done if that individual is an active member in the company while all other members are inactive or silent members. 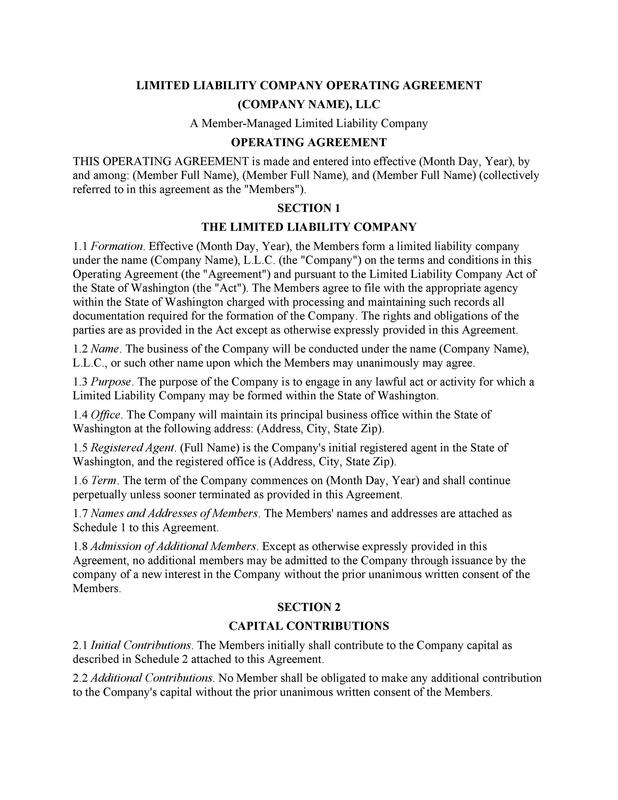 Also, this section of an LLC operating agreement will contain the name and registered agent of the company along with the purpose of the business and the principal place from where the business will be conducted. 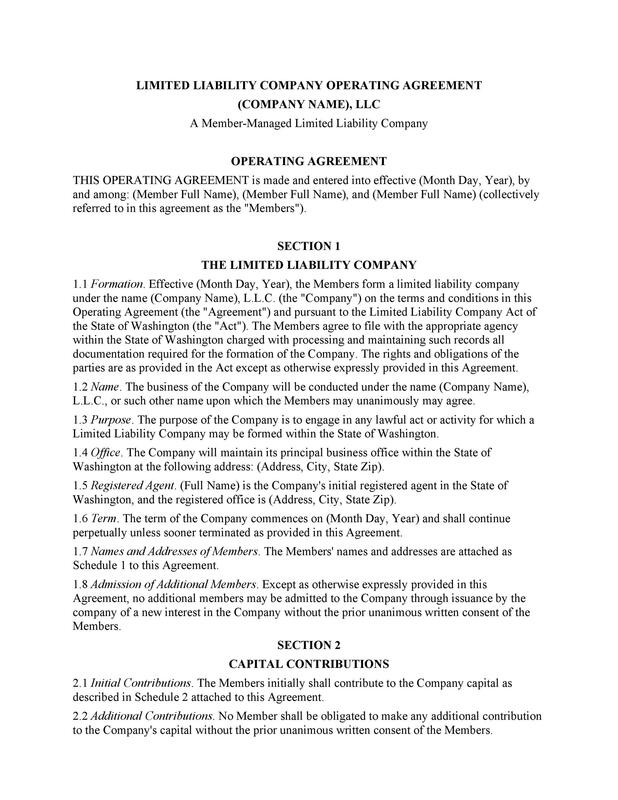 In this section of the LLC operating agreement, it will be specified that when exactly will the company be distributing the profits among its members. Members can choose to withdraw profits monthly, quarterly, semiannually or at will, but it has to be mentioned in the LLC operating agreement otherwise it will be considered as an illegal step if the members do not adhere to the rules that they themselves have drafted for their company. All the profits that the company has earned belong to shareholders/owners but it is not a wise step to withdraw every single penny from the profits of the company. A business should not remain stagnant; rather it should grow with the passage of time this is why it is important that out of the profits that the firm has generated, some portion of it must be retained by the company for any future growth/expansion plans. The share of money that the business will retain is mentioned in this section of the operating agreement. One important thing to pin point here is that these profits and losses are shared among members on the basis of distributive shares and not the percentage of capital that they have invested in the company. 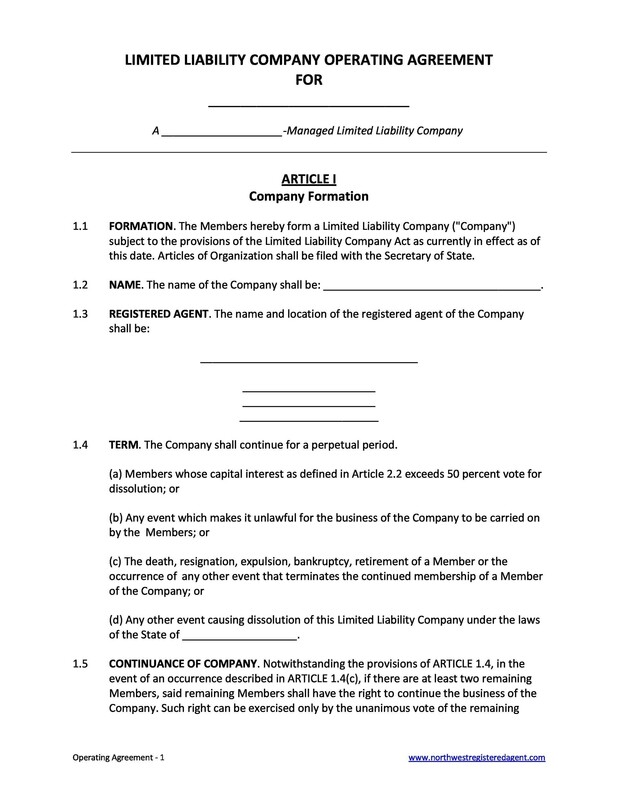 Members can set this share percentage in the LLC operating agreement after the consent of every member. A member of the company is usually an investor who does not have enough time nor is he interested in managing the day-to-day operations of the company. This is why there is a need to appoint managers in the company who will be responsible for managing the operations and to increase the shareholders/owner’s wealth. 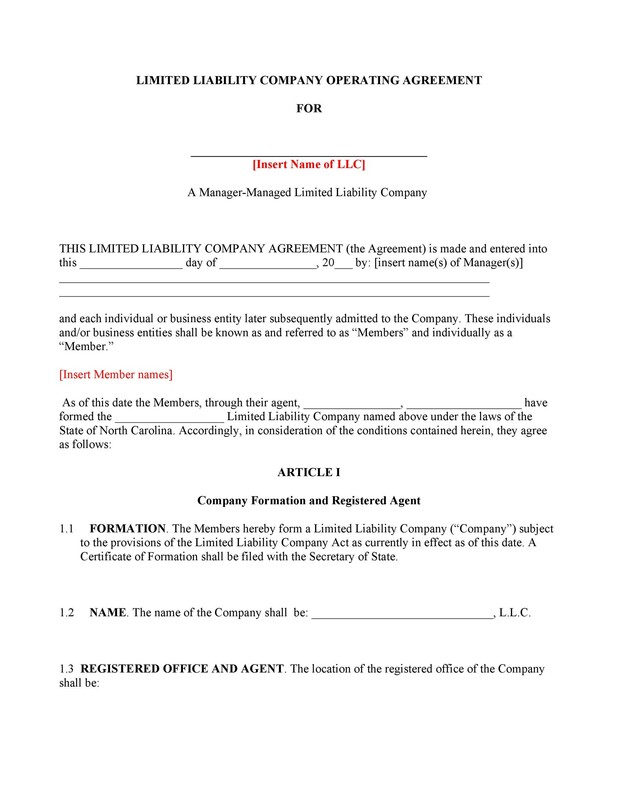 A member of the company can also become the manager in the company but then the powers vested in the managerial role must be laid down in this section of the LLC operating agreement. This section will also answer some critical questions like, who will make the decisions in the company and what will be its procedure? Will any manager be included in the board of directors? What will be the responsibilities of each manager? 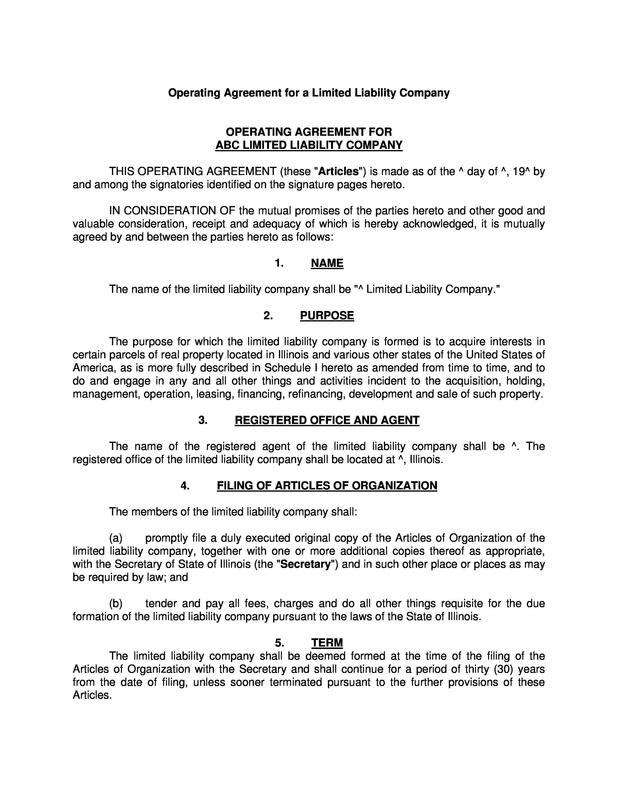 All these questions must necessarily be answered in the LLC operating agreement in order to avoid any confusion among the mangers and members. 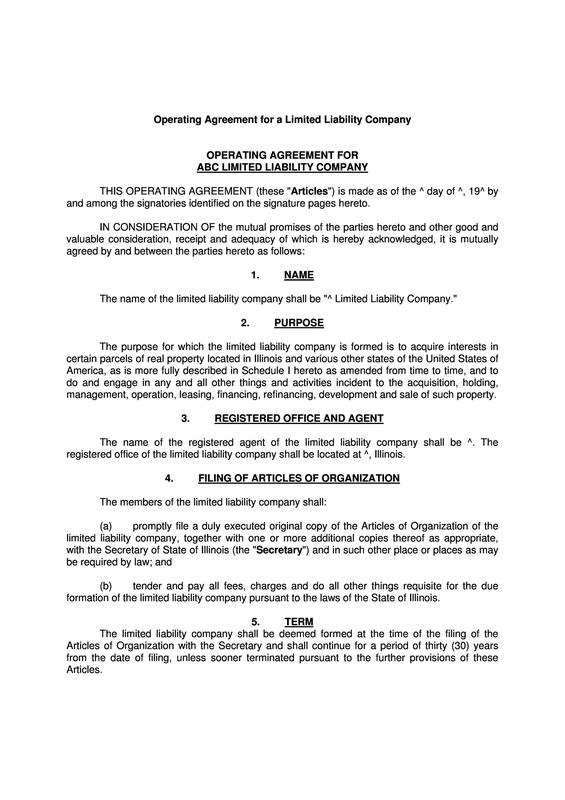 It seems so obvious that every manager who is rendering services for the company will be compensated but as we discussed earlier that this LLC operating agreement is like the bible of the company, this is why it is important to mention that all the managers will be paid for their services. 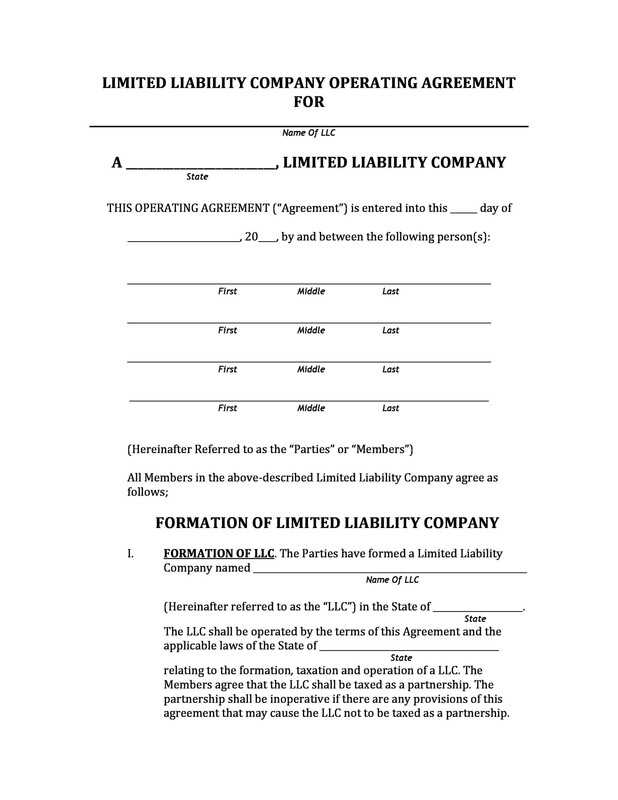 This section of LLC operating agreement will contain the provisions that the members of the company will be reimbursed if any out-of-pocket expenses are incurred by them during the course of managing the company. It will be deemed illegal if the members withdrew the money but there was no relevant provision in the operating agreement that allows them to do so. This makes it imperative that whichever LLC operating agreement template you choose, it must be customized to cover all the provisions that will allow the members of the company to exercise full control over their LLC. The transaction that your business does and the revenue that it generates have to be recorded in the books of the company. If you happen to have an academic background in business accounting or management accounting, then you will understand that there are numerous ways in which the accounting statements can be prepared. 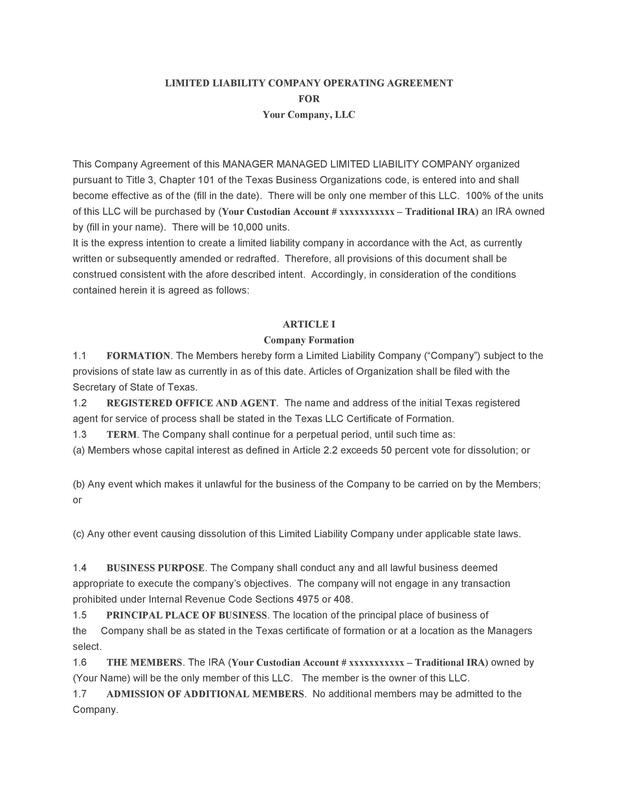 Whichever accounting method/policy the members of the business agree upon must be mentioned in the ‘Accounting’ section of operating agreement. Also, it must be noted that the accounting policy once chosen can be changed afterwards but it is always better to maintain consistency in your accounting policies in order to avoid audit by the regulator. Also, if you are to delegate the responsibility of managing the operations of business by appointing managers in the company then it is important that you add a provision in the LLC operating agreement making it necessary and obligatory upon managers to disclose the audited financial statements of the company to its owners. This helps the owners to maintain their control in the company and to avoid any financial shenanigan. When you have spotted an opportunity in the market and have partnered with various individuals who are ready to pool in their money and become the members of the new venture, everything will look so bright and optimistic, but things change. Everything that has a beginning has an end, whether it is a human life, company’s life, life of a planet, or even life of a galaxy, this is why it is necessary to be realistic and decide the procedure of winding up and liquidating the company right at the time of its inception. The section of ‘dissolution’, in the operating agreement, will lay down the procedures and rules through which the company can be liquidated. Mostly, this is done through a vote by every member of the LLC. 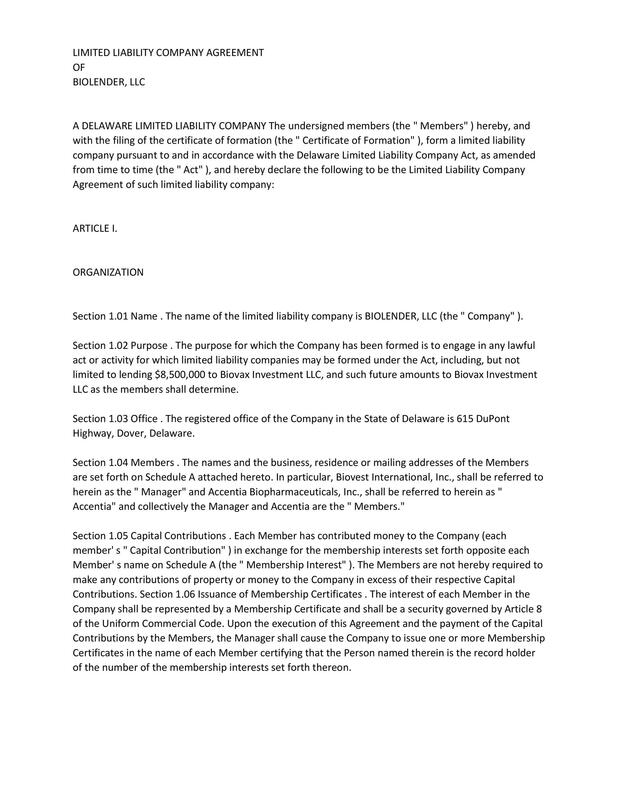 A member of an LLC is any individual or any legal entity that has invested a certain amount of capital in the company or must have provided services, property, etc. for gaining ownership interest in the company. Each and every member of the LLC reserves the right to sell his/her stake in the company and separate himself/herself from the operations of the company. To whom are they eligible to sell their share of ownership? To whom they cannot sell? What procedures/rules will be involved if the member decides to leave the company? 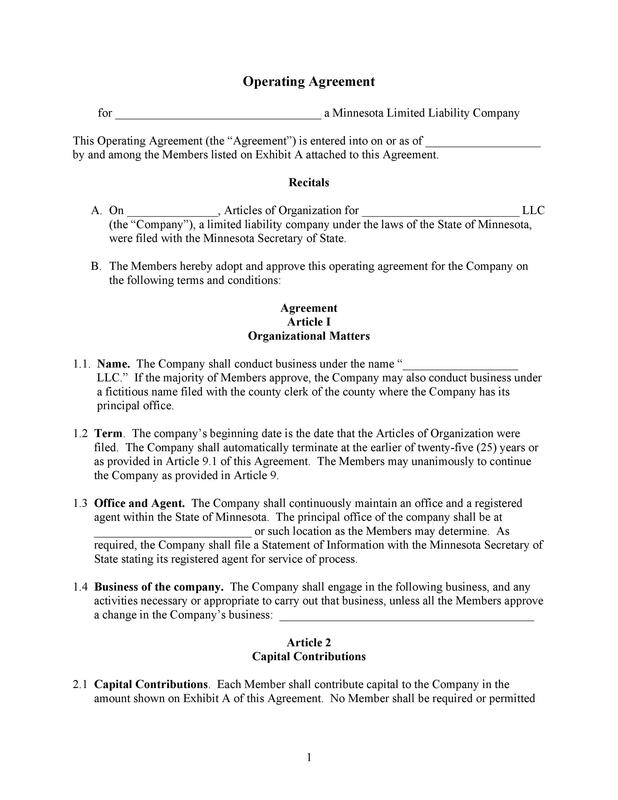 All these questions are answered in the ‘Member Withdrawal’ or ‘Buy-Sell Agreement’ of the LLC’s operating agreement.